Last week, the Statue Fund, the sponsors of a monument to women’s suffrage, announced that artist Meredith Bergmann was chosen as the winner of the design competition for the monument, which is slated to be installed in Central Park in 2020. The monument will depict Elizabeth Cady Stanton and Susan B. Anthony and will honor the many others who contributed to the advancement of women’s rights. It will be the first statue in Central Park to represent an actual woman. The monument will be installed along the Mall — one of the most visited areas of Central Park — on the southern end, in a section known as Literary Walk that features statues of well-known writers such as William Shakespeare and Robert Burns. The Central Park Conservancy worked with the City to select this location, a process that was closely informed by the history of Central Park and its collection of 65 works of art, including numerous commemorative monuments. The women’s monument will stand on the west side of the Mall, across from the statue of poet Fitz-Greene Halleck. Monuments were not part of the original design for Central Park, which was created for the purpose of providing the residents of the City with an opportunity to escape urban conditions and connect with nature. The Park’s creators considered monuments, along with many other features and attractions suggested by some to be included in the new Park, as inconsistent with the purpose of the Park as a rural retreat. However, in response to pressures to introduce commemorative monuments, particularly following the Civil War, a policy was established in 1873 to guide the inclusion of monuments in the Park. In addition to establishing specific criteria and a process for evaluating proposals, the policy limited the locations that would be considered as sites for monuments to Park entrances and the Mall. Entrances were deemed appropriate locations for monuments because they represented the threshold between the City and the Park, along with the Mall in light of its design and function as a formal promenade. While many of the monuments introduced in the early years of the Park adhered to the 1873 policy, exceptions increased in the latter years of the 19th century. Changing conceptions of public art and commemoration influenced the nature and design of sculpture and statuary in the Park through much of the 20th century until the 1960s. In that decade, the growing historic preservation movement on a national and local level influenced a renewed emphasis on and appreciation of the Park’s original design and purpose, and focused public attention on its preservation. With the Park’s designation as both a national and local landmark, the addition of any new elements would come under much greater scrutiny and review, with a presumption against permitting the introduction of anything inconsistent with the Park’s original design and purpose. 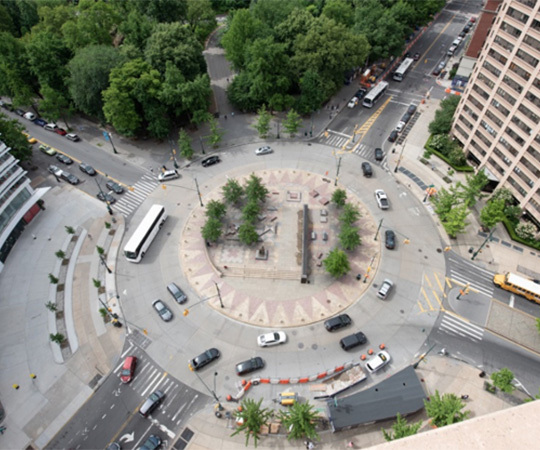 In the more than half-century since, prominent new monuments commemorating Frederick Douglass and Duke Ellington have been established at plazas adjacent to the major entrances at the northern corners of the Park, but no new monuments have been introduced within the Park proper. Unlike the traditional commemorative monuments in Central Park, the statue of Frederick Douglass was integrated into its site as part of a comprehensively designed plaza incorporating other forms of public art. After the City agreed that it was important to commemorate Stanton and Anthony and the woman suffrage movement, it also agreed to contemplate introducing a monument in Central Park for the first time since the Park was designated a landmark. That decision was made in light of the unique consideration that there are no representations of women — who make up over half of the population — in New York’s flagship park. New York’s public art collection includes only five statues of historical women. Central Park’s collection of public art includes representations of fictional and allegorical women and monuments by women artists, but no statues of actual women. The City and the Conservancy initially proposed a location on the perimeter, in accordance with Central Park’s historic policies, so that the statue would be more visible and connected to the urban fabric. The City and the Conservancy also evaluated the Mall, the other traditional location for commemorative statues. In the section known as Literary Walk, they identified a space where the placement of a new monument would be consistent with the design and purpose of the Mall as well as the siting of the other monuments in the area. Proceeding north along Literary Walk are two statues of Scottish writers, Robert Burns and Sir Walter Scott, who face one another along the main promenade, reinforcing the sense of symmetry that is characteristic of the design of the Mall. Further north along the Mall is the statue of writer Fitz-Greene Halleck, but there is no sculpture facing him, breaking this symmetry. (Based on the arrangement of these three monuments, it is likely that this spot was designated for a monument.) The City and the Conservancy identified this spot as the site for the monument and developed guidelines stipulating that the design be consistent with the character of the landscape and the scale and siting of the other monuments along Literary Walk. The location of the woman suffrage monument, near numerous historic statues of men, will highlight how women have been underrepresented in the City’s memorials and monuments. In June, the City announced She Built NYC, an initiative to commission an artwork or monument on City property honoring women and women’s history. This example of the City taking a lead on a new monument is the result of recommendations by the Mayoral Advisory Commission on City Art, Monuments, and Markers, which convened to evaluate public art and historic monuments on City property. Like the Central Park woman suffrage monument, this initiative is another step toward creating a public realm that is more inclusive and representative of the City’s diverse history and culture. Learn more about the history of Central Park’s statues and monuments.